Akerson: “We need people who are well-educated, talented and motivated." DETROIT -- The U.S. auto industry is in full recovery mode and industry leaders are taking to the commencement circuit to tout the turnaround and recruit critical engineering and management talent. It's a sharp contrast to the past few years when the severe sales downturn and financial woes forced executives to hunker down and focus on restructuring, downsizing and simply trying to make sure their companies survive. General Motors, Ford Motor Co. and Chrysler Group are generating some of their biggest profits -- a combined $4.5 billion in North America during the first-quarter -- on much smaller industry sales volumes. 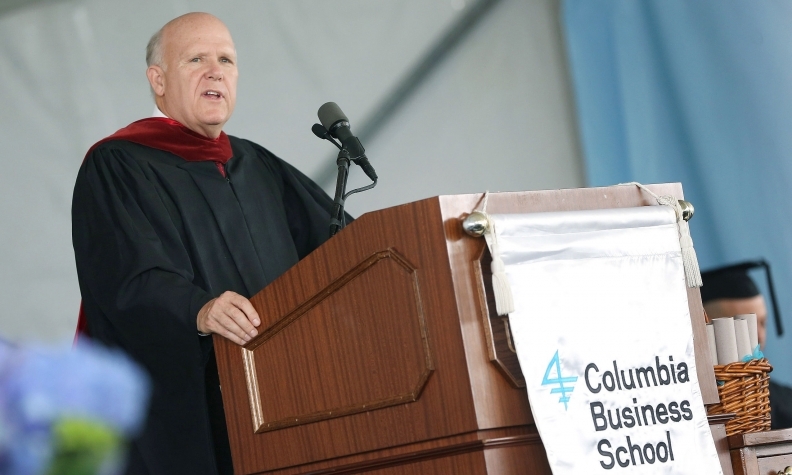 "The auto industry has gone from being an anchor on the economy to being the wind in its sails … in fact, we're one of the few bright spots," GM CEO Dan Akerson told the graduating class last month at Columbia University's graduate school of business in New York. "We're adding jobs and investing in America, just as America invested in us." He briefly touched on how the automaker was devastated by the Great Recession. "GM, a one-time colossus that ruled the corporate world, that set the standard of success for business schools to study, became the case study for failure," Akerson said. "GM was broken and nearly died." Akerson credited the Bush and Obama administrations for rising above "petulant partisan politics" to rescue and help restructure two of the Detroit 3. "Together they saved the auto industry, and by extension, this nation's manufacturing base," Akerson said. "And in so doing, they likely prevented an even greater economic collapse than we experienced." The U.S. Treasury still holds a 26 percent stake in GM stemming from its government bailout. The auto industry, Akerson said, is playing a key role as the nation's economy inches back to recovery: it employs 8 million workers today -- or 1 in 17 private-sector jobs -- and accounts for 3 to 3.5 percent of the nation's gross domestic output. Near the end of his speech, Akerson encouraged the audience to consider a career in the auto industry. "We need people who are well-educated, talented and motivated," Akerson said. "We need you." The plea for graduates to pursue careers in the auto industry is a major reason executives give commencement addresses, said Dave Cole, chairman emeritus of the Center for Automotive Research in Ann Arbor, Mich.
"We do not have the talent to support manufacturing emerging from our K-12 schools and our colleges and universities," Cole said. "We're entering a period today where we're going to be so short of key talent that we need to turn young people -- both men and women -- on to the potential opportunities in the auto industry," he said. Ford CEO Alan Mulally, in a May speech to the graduating class at his alma mater, the University of Kansas, urged students to follow their passions for the betterment of society. Mulally recalled that in his first management job at aerospace giant Boeing Corp., he wasn't the renowned leader he is today. "Over time, I learned that the most effective managers and leaders connect people to the compelling vision of the enterprise in a way that benefits the individual and benefits the organization," Mulally said. He suggested that graduates must be prepared for career challenges along the way, such as the one he faced at Ford when the U.S. auto industry was on the brink of collapse after the 2008 financial crisis. "We may have to do things differently or move in an entirely new direction, but for those of us who continue to follow our passions, and at the same time deal with reality, a setback can become a gem -- a gift that life gives us," Mulally said. "We are creating an exciting, viable and profitably growing company for the good of all of our stakeholders. We are building great products, creating a strong business and contributing to a better world." Mulally, like Akerson, said the auto industry provides opportunities for graduates seeking to make a difference with their careers. "I have had the honor of working for two great American and global icons," Mulally said of Boeing and Ford. "Both companies are contributing solutions to the three critical issues of our times: economic development, energy independence and environmental sustainability." Cole said the commencement speeches also provide executives with an important opportunity to educate the public on automotive manufacturing. "The auto industry, largely outside of [southeast Michigan] and the manufacturing areas of the Midwest, is viewed as something very different than it really is," Cole said, noting that few people outside of the industry understand its inner workings. "They're also trying to create a [new] image of the industry that has been tarnished over the past few years," Cole said. Elon Musk, CEO of Tesla Motors Inc., told the graduating class at the California Institute of Technology this month that he started the company to show consumers the potential of the electric car. "We had to change people's perceptions of an electric vehicle," Musk said, "because they used to think of it as something slow and ugly, and had low range, like a golf cart." Musk told the Caltech audience that the company's Model S, a new full-sized electric sedan, was inspired by people who asserted that even though Tesla could build a small-volume EV, it would be difficult for the startup to build a "real car." Moreover, he told the audience, the EV maker is determined to help solve what he believes is the world's biggest problem: a shortage of sustainable energy. "If we don't solve that [in] this century," Musk said, "we're in deep trouble." In a commencement address in May at Bradley University in Peoria, Ill., Ford Executive Chairman Bill Ford told the audience how he came to the family business with environmentalist beliefs that, at the time, were considered controversial and counter to the company's mission. "… I was considered a radical, and was asked to stop associating with any known or suspected environmentalists," Ford said in prepared remarks. He said the automaker, founded by his great-grandfather, Henry Ford, has since better aligned itself with his beliefs. "As I look ahead, I am optimistic that our vehicles will have a very light environmental impact," Ford said. "We still have work to do, but our industry is on its way to meeting the environmental challenge with new technology and vastly cleaner solutions." Ford said he didn't listen to top executives at the automaker who urged him to stay away from the green movement, and he encouraged the audience to assert their beliefs. "Don't be afraid to do things differently, and don't be discouraged by setbacks. If you are doing what you believe in, and are trying to make the world better, you already are on your way to success."